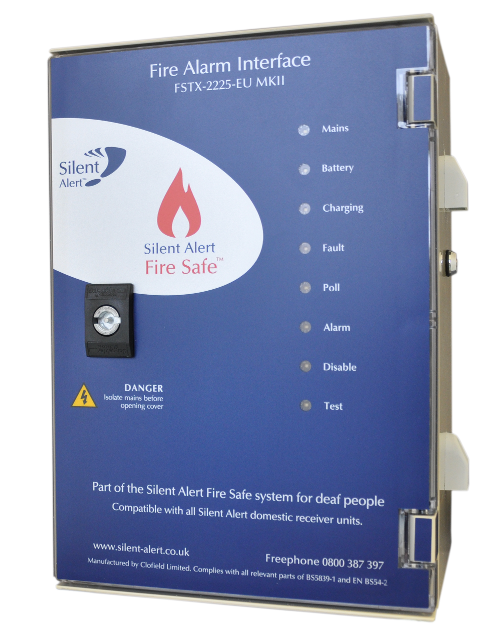 The Silent Alert Fire Safe system offers service providers a simple and cost effective way to providing fire alarm cover for people who are deaf within public buildings and workplaces. Fire Safe links directly to your exisiting Fire Alarm system and is triggered automatically when the Fire Alarm is activated. The system is radio licence exempt and can be installed and serviced by any fire alarm maintenance company. These factors help to keep ongoing costs low and helps service providers fulfil their obligations under the fully implemented Disability Discrimination Act. • BS5839 Fire detection and fire alarm systems for buildings. • BS EN54-2 Fire detection and fire alarm systems. Part 2. The Fire Safe system has an open air operating range of up to 1000 metres.